Maggie's Brain, otherwise known as What Maggie's Thinking, is the tenth Simpsons short. It aired on The Tracey Ullman Show on October 11, 1987. 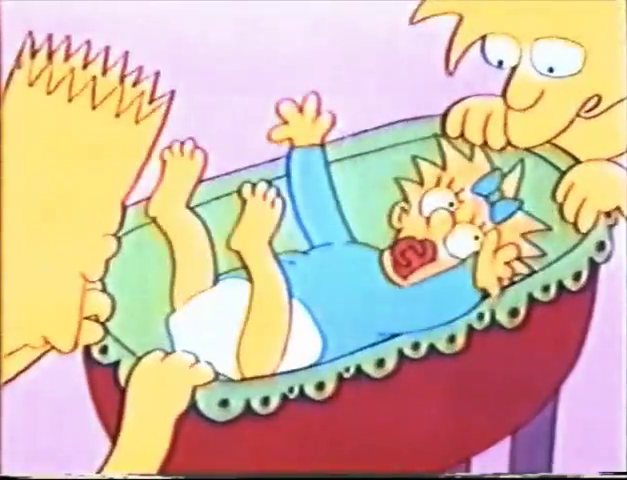 Bart and Lisa, wonder what Maggie is thinking while she is sleeping in her crib. Bart moves her toes and sings, until Maggie kicks him, to which Lisa says "she's trying to say 'game over'". Bart then leans over and babbles to Maggie, but she shoves her bottle in his mouth. Maggie sees her siblings as negative figures, attempting to attack her. Bart and Lisa wonder what the hopes and dreams of a tiny infant inside a crib actually are, and imagine Maggie doing the same to them as they are doing to her. Modified on October 11, 2017, at 13:41.